Milling and measuring workpieces up to three metres in width has been quite common at the company De Rooy Slijpcentrum from Nuenen (the Netherlands). Grinding operations, however, were another story. Until now! With the purchase of a new DANOBAT surface grinder, the company can now also machine the largest workpieces with the utmost accuracy. "We managed to handle wide workpieces for milling and measuring, but for grinding we were limited to a width of 1700 mm and a workpiece weight of 10 tonnes." says Dirk De Rooy, who leads the company together with his brother Adam. Now, with the arrival of the brand new DANOBAT surface grinder this February, that limitation is overcome. The DANOBAT surface grinding machine has a range of 8000x3000x1600 mm with a maximum workpiece weight of 30 tonnes. The large range of the machine is quite unique, certainly in Europe. "There are some other similar large machines in Europe but only gigantic old monsters for surface grinding. DANOBAT grinding machine is CNC-controlled", says Adam De Rooy. "Our measuring machine has a range of 6000x3000x1600 mm. Our milling machines can handle those widths, even slightly wider. But our grinders were limited to a capacity of 1700 mm in width". So now, that's almost doubled thanks to DANOBAT solution. The machine is fitted with two grinding heads. "One for surface grinding and the other head can swing in any direction. This machine lends itself perfectly for interpolating the table movement with the movement of the grinding wheel. This makes it possible to grind a curve in the workpiece. And in Europe, no one else except DANOBAT can do that on these dimensions," Adam claims. Large steel plates which until recently could only be milled, can now be ground, completely in line with the growing demand. "How can you make something to a precision of one micron if the machine you use is not precise" Dirk De Rooy wondered. "With this DANOBAT CNC grinder you can make products to a precision of two thousandth of a mm." The singularity is that many of the items of the DANOBAT surface grinding machine itself are also ground. This is the only way to guarantee an accuracy of up to two-thousandth of a mm. De Rooy will use the DANOBAT grinding machine for the manufacture of parts for large machines, such as large textile machines or printing presses for example. 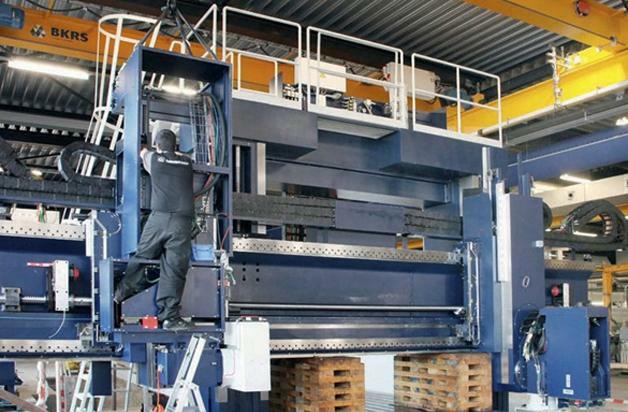 "A base plate for a machine like this must be very accurate, because everything is built on top of it", Dirk De Rooy knows. The brothers think that demand for grinding workpieces wider than three meters will only grow in the future. If you just consider a large player on the market such as ASML, "Each time ASML builds a new machine, it is larger and more accurate than the previous one. The lines drawn by these machines for computer chip manufacturing are increasingly thinner, distances of just eight nano metres are not uncommon. The parts for these machines must also have to be more and more precise. Otherwise you can never make that final product," says Adam De Rooy. Some 30% of the turnover of De Rooy Slĳpcentrum is earned on the German market. Precisely on this market the grinding specialist was faced with the limits of the machine in use up to now. In order to recoup the investment, the new DANOBAT machine will have to be operational on a full-time basis. "After all this is an investment of millions of Euro", Dirk Van Rooy explains. "Our milling section is open one hundred hours a week and we aim to have the DANOBAT machine at that level as quickly as possible".